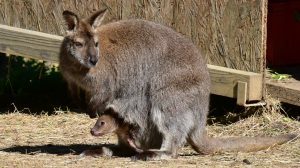 The geographical distribution of kangaroo-like animals are Australia, Tasmania and New Guinea. Their narrow, elongated feet allow springy and wide jumps. A hunted kangaroo stands with its back against a tree, kicking the opponent with the very strong hind legs. Since they are not water-shy, they also escape into chest-deep water and try to drown their enemy.